Tradesmans tokens were an important part of the currency mix in Australia during the middle of the 19th century. There was a constant shortage of small change so from 1849 some traders began issuing halfpenny, penny and a few threepence tokens to fill the void. They also were a source of profit as the trader was rarely required to redeem all coins issued and the cost of manufacture was less than the nominal value. Initially tolerated by authorities, after a few years there were so many circulating they were declared illegal. This was initially in Victoria in 1863 and finally in WA in 1878. There were around 200 issuers and catalogues record over 600 different types. Halfpenny Token. Issued by Mrs. Fisher, Draper of Gardiners Creek Road. 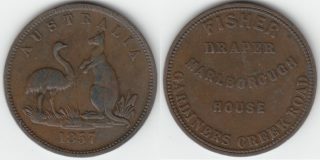 Believed to be the only Australian token issued by a woman. This halfpenny token shows “Australia”, the Emu and Kangaroo and the date 1857 on the reverse. The obverse, generally ascribed to the issuers details shows “Fisher”, Draper of Marlborough House in Gardiners Creek Road. This was in South Yarra, Melbourne. That road is now called Toorak Road. This token is unique in the Australian series as it is the only one issued by a woman. Token collecting seems to have a dedicated group of numismatists. Many issuers can be difficult to find, especially in an undamaged state. The rarest tokens can command high prices. A rare Bell and Gardner of Rockhampton penny recently sold for over 1800 pounds at a Baldwins sale.